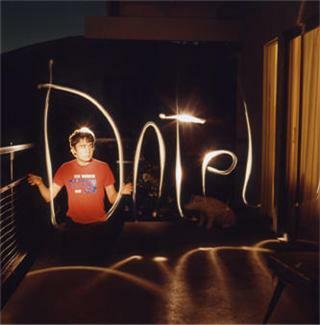 Dntel is the operational alias for Los Angeles resident Jimmy Tamborello. Jimmy also sometimes records and releases music under the name James Figurine. He is also the host of the Dublab show Dying Songs. And, he is also, its true, one half of The Postal Service (whose 2003 album Give Up is Sub Pops second best-selling album of all time). In 2007, we at Sub Pop released the most recent Dntel album, entitled Dumb Luck which included contributions from a whole raft of talented people too numerous to list here (a short version of that list would include members of Grizzly Bear, Rilo Kiley, Bright Eyes, and Arthur & Yu). On Dec. 7th, 2010 we are releasing new music from Dntel in the form of a pair of companion EPs, entitled After Parties 1 and (very sensibly, given their complementary relationship) After Parties 2. These two EPs collect 8 new Dntel tracks (3 on After Parties 1 and 5 on After Parties 2) which are a bit more minimalist and experimental in nature, all of them instrumental, and feature (to the best of our knowledge) a list of guest contributors numbering exactly zero. These 8 new tracks are also, we are able to discern even through the mist of biases both personal and professional, really something special.